Over the last five years, our company, our customers, and our Team Members have benefited greatly from the work of Dr. Matthew Tripp, our Chief Scientific Officer. His contributions to research and the development of our products has been invaluable in our mission to transform lives around the world. 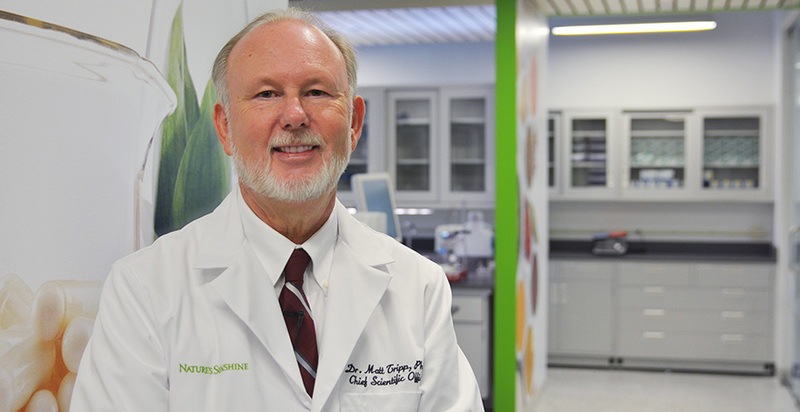 Effective May 07, 2018, Dr. Tripp has retired from his position at Nature's Sunshine Products and Synergy WorldWide to enjoy time with his family. During his tenure, Dr. Tripp established robust formulation and validation capabilities for our company. He launched groundbreaking new products and systems and proved their efficacy. A recent example of his work is Metabolic LDL, the latest clinically studied, patent-pending addition to the Synergy product portfolio, proven to reduce cholesterol using safe, powerful, and natural ingredients. Dr. Tripp led the planning, opening and original operation of the Hughes Center for Research and Innovation. Under his leadership, the staff at the Hughes Center analyzed Synergy products new and old, studied ingredients and samples, and bolstered the strong, scientific foundation for Synergy's future. Synergy has been extremely fortunate to work with Dr. Tripp at the tail end of his illustrious career, coming to us with many years of experience and a well-established knowledge of human health. Looking ahead, Dr. Tripp's research and methods will continue with the talented and extremely innovative team he assembled. This bright team, composed of qualified scientists and clinicians, is passionate about continuing to help people achieve Elite Health. In just a few short months, the Hughes Center will relocate along with Synergy to the main floor of the beautiful new building we will share with Nature's Sunshine. In just a few steps, those who come to visit the new Synergy offices will be able to see the state-of-the-art labs and clinics for themselves. Perhaps your visit will be an occasion to reflect on the contributions of Dr. Tripp, as well as a chance to look to the future of Synergy's science-based product commitment. At this time, we wish Dr. Tripp and his family all the best in retirement. We thank him for his important work, for his numerous trainings and presentations, and for his contributions and dedication to Elite Health. With Synergy, he truly leaves a legacy that we are ready to build upon. "Dr. Tripp's important work for Synergy WorldWide is immeasurable. We thank him for the legacy he leaves and for establishing the Hughes Center, which has greatly impacted how our products support Elite Health around the world. It has been a pleasure having him on our team, and we look forward to the continued research and studies from his highly-skilled team." For more information on the Hughes Center for Research and Innovation, click here. 2018 Leadership Retreat: Cruise the Caribbean! Synergy WorldWide is pleased to announce the details for this year's highly-anticipated North American Leadership Retreat! Set sail on Royal Caribbean's Brilliance of the Seas Cruise Ship for a five-night voyage. Departing from Tampa, Florida, this magnificent trip includes stops in Georgetown, Grand Cayman and Cozumel, Mexico. We look forward to delivering you the fun, the food, and the experience you deserve. Where: Depart from Tampa, Florida, with stops in Georgetown, Grand Cayman and Cozumel, Mexico. Who: Qualifying Team Member. See the qualification details for information on how to qualify to bring a guest. Qualification Period: January 2018 - September 2018. First-time qualifiers include new Team Leaders and Team Managers. All first-time qualifiers must also be Elite Honors qualified 3 or more times within the qualification period. Want to join us? You still have time to qualify!